I’m sick for the first time in Switzerland. I’m not sure, when I caught it, it might be just combination of more things and sick colleague in my office was just the last thing. I thought it’s just something like common cold, so I tried to cure it at home and went to work on Monday and Tuesday as usual. They told me, I can stay at home without doctor’s note for two days. I stayed at home on Wednesday. Because I didn’t felt so well even on Wednesday, I’ve concluded that I have to go to the doctor. I was a bit afraid to go to the doctor abroad, because if I get sick on my abroad trips, I always survived a few days and never used travel insurance. I usually visited doctor after returning to the Czech Republic, but this solution is not applicable right now. Before my arrival, I asked AIESEC whether is necessary to pay health insurance in Switzerland or I don’t have to pay health insurance here and I can pay it in Czech Republic as a self-payer with travel insurance. It’s perfectly OK to have only travel insurance. I bought my travel insurance at Allianz, it’s my favorite insurance company and I’m buying there travel insurance since 2007. Luckily, I never used my travel insurance – until now. It’s mandatory by law to have health insurance here. My travel insurance also includes liability insure for my accommodation, so I didn’t have to pay another one. On Wednesday evening, I called assistance service. I had to ask them, what should I do. Operator was very pleasant. At first, he took my Swiss number and called me back, so I didn’t have to pay much for phone. He asked me about my personal details, what is my problem and how long I feel sick. He assured me, he will contact local branch of Allianz and send me address of medical facility close to my home early in the morning in SMS to my Swiss phone. He also promised, that he will also arrange guarantee about payment of my treatment directly by Allianz. Operator also offered possibility, that doctor would visit me at home. I reject this offer and truly admitted, that I don’t feel so bad and I would also need to clean my apartment – it doesn’t look fancy after 5 days being sick. After some time, I also realized, it was wise decision, because medical facility is equipped with various equipment, which might be also useful. On Thursday morning, I’ve got SMS from Allianz. There was name of the facility, address, phone contact and office hours. They arranged me an appointment in mediX toujours next to Basel SBB – It was nice, only 4 stops by bus. Office hours are daily from 7:00 to 22:00 including Sundays and bank holidays. I arrived to mediX toujours at 13:45 and I was there the only person, looked promising. One of the receptionist welcomed me and when I told her, who am I and what I’m doing there, she already knew about me and had several papers printed out. She asked me to fill in form, like I know only from movies. There were personal data, occupation, insurance company/number etc. It took some time for me, because I had to ask for a few from fields, so 3 other people were faster than I. When I returned filled in form, I just sat into the waiting room. After some time waiting, doctor came to pick me up and we went to hers ordination. I told her, what is wrong and how I tried to get better. I also showed her packages of all drugs, that I took – she recognized everything, even if they were from the Czech Republic with Czech labels. She commended me for my effort to cure myself and then she proceeded to the investigation. Investigation was as I was expecting, she was listening my lungs, checked my throat and palpated my neck and head. During this investigation, she also asked me several complementary questions about progression of my illness. After this procedures, she asked me to sit in the waiting room again and assistant will take blood sample from my forefinger. After short waiting time, I was invited to separate room to give a blood sample. I was giving blood samples many times, but never this way. She stabbed my forefinger and then she was catching blood drops to thin transparent tube. She took 5 or 6 blood drops, then she shake down the blood to very small transparent “bottle” and threw away the tube. Then I sat again to the waiting room. When my doctor got the results, she invited me again to her ordination. She told me, I have irritation of secondary sinus nasal and bronchitis. I was expecting something less “serious”, but could be worse. So, she prescribed me antibiotics and some other drugs. Doctor also printed out sick certificate for my work. Before I left, I just stopped at the reception again, whether I can go or is necessary to do something else. They just checked their papers and told me, that Allianz will cover everything and I can go home. So I left at 15:10, considering I came there at “random” time, this is not bad time. Everyone there was very nice, pleasant and spoke English. 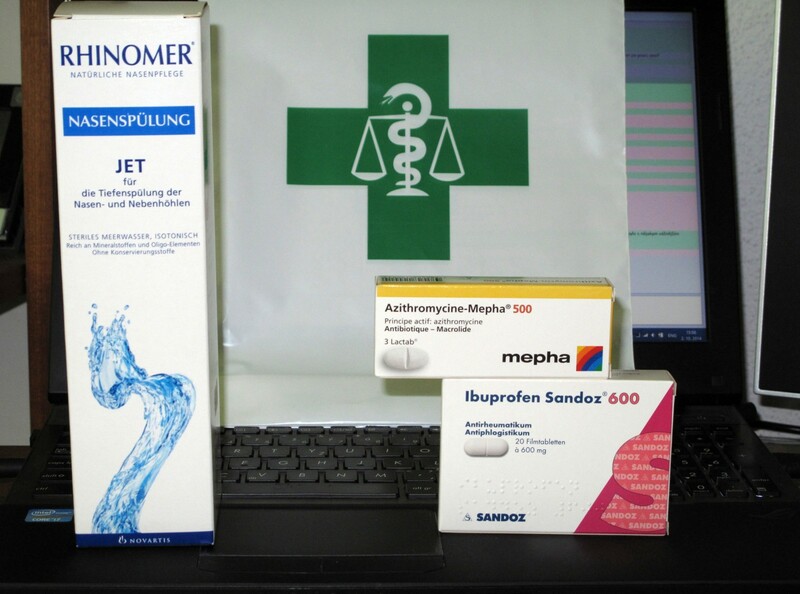 Then I went home, to take a picture of the prescription, to have it archived and then I went to the Pilger Apotheke. Again, there was no problem, after some waiting time I’ve got everything. My waiting time was a bit longer, because I didn’t know, that I can keep the prescription, so next time, I will not ask them to write dosages on the box. By the way, they just didn’t write it there by a ball pen, but they printed it out. I only forget to ask, where there is anything special about the drugs, because manual is only in German, French and Italian. I hope, there will be no next time, but next time, I will have to ask about it. Luckily it was quiet clear expect one thing for my nose, but after some time, I figured it out. When I was waiting in the pharmacy, I was observing staff and customers. This pharmacy is middle sized and I saw there 9 pharmacists – quite a lot, but the longest queue was 1 person and probably maximal waiting time was about 30 seconds. I was quite worried about medical terms in English. I think, I can fluently speak about many topics, but I know nothing about medicine. I prepared small cheat-sheet with symptoms of my disease and took tablet with Czech ↔ English and Czech ↔ German dictionaries. Well, surprisingly, I understood everything, I only used my fancy cheat-sheet to check whether I told the doctor everything and then read only one phrase “cough up sputum” and I even didn’t take out tablet from my backpack. After a few days, I feel really much better and even if I really didn’t want to go to the doctor, I’m glad I went there. Everyone was nice and at least I tried to use travel insurance for the first time and hopefully also for the last for very long time.